This hard water formula is perfect for those that struggle with the toughest of water types! Hard Rock will blow you away! 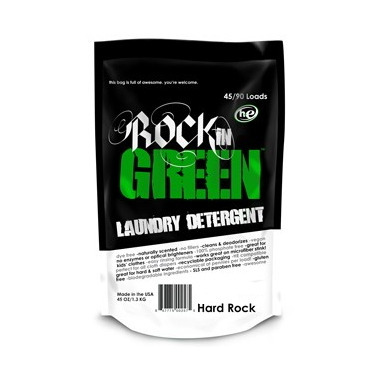 If you struggle with stinky cloth diaper laundry, Hard Rock is for you! It's gentle on baby's skin, but tough on stink and grime. Overall extremely happy with all of the Rockin Green products I've tried! The scents are really nice, and I like that they're not filled with irritating junk. We used this for my son from birth, since Tide Free and Gentle (and even natural brands!) were giving him rashes. The reason for only 4 stars? Not in love with the packaging and having to reach into the bag AND I find the fragrance washes away. If it wasn't quite as expensive I would love to use it for our whole family! Cloth diaper game changer for hard water! I am so happy with this product and I recommend it to all my cloth diapering friends and family with hard water. I was having such a hard time getting my stash clean and build up free until I used hard rock. Only down side is the packaging... it's annoying trying to get my hand in the bag to scoop the powder especially as it gets below half full. I would love a spout like a salt box has or a earth friendly hard container to make use easier! Due to the nature of cloth diapering my hands are going between wet and residue filled from placing my whole hand in the bag (yes I dry them before!)... seems like a waste of product and time. Diapers smelling good whive it. It make the job. I started using this detergent a few years ago to wash cloth diapers and liked it so much I now use it for all the laundry. I love the smell of smashing watermelons (all the rockin green scents smell great) and the hard Rock cleans so much better with our hard water. I also love that only a small amount is needed so i can store a small bag instead of a huge box of detergent. Great for sensitive skin too! This is the only detergent I will ever use to wash our family's cloth diapers. It works wonderfully and never fails to get even the stinkiest diapers and pull ups clean. Great Detergent! It's the only detergent that works on the diapers with our hard water. I have tried other 'cheaper' brands with dismal results. Love it! Works great on our hard water. Laundry smells wonderful. It's just unfortunate that the scent rinses away with the diapers. Great detergent! I use it for regular laundry (no diapers in our house) and it works really well, especially with having hard water. The scent is lovely. Love this!! We have really hard water here and its amazing, we use it for my daughters diapers and all our clothes! Works perfect and smells great! Works great in hard water on our cloth diapers. The amount you need for cloth diapers in a front loader is miniscule, I think I use about 1/2 tablespoon per load, so will last a long time. Also, I haven't had to strip (the diapers, haha) since we began using. This detergent is amazing. We have very hard water and this is the only detergent that doesn't cause a smell to our cloth diapers. If it was cheaper, I would use it for all of our laundry. I am so glad to be able to use it for my cloth diapers though! Probably the best cloth diaper detergent on the market. Always the best for our hard well water. Love love love! Also use for pads too and works magnificently! This detergent is all I use for my cloth diapers! Love this product, smell is great but doesn't linger afterwards and the hard rock version is amazing in our water. Highly recommend for cloth diaper laundry and family laundry. Great detergent for diapers! The only one I use! Lots of different scents & water types! This is by far the best laundry detergent for washing cloth diapers! It smells so great and I never have any problems with diaper rash or residue on the diapers. Washing cloth diapers is a fine science, making sure you don't over or under soap them. Rockin' Green Hard rock made my science easy! Formulated to best work in water conditions like I have in my neck of the woods it cleans my diapers so they are sparkly clean and do not repel. One bag goes a long way too, I am on my 3rd bag of RNG and I have been cloth diapering for almost 2 years. I highly recommend all of Rockin' Green's products, but this one is my favorite! Definitely worth the money. I tried a different brand once, and it gave my little one a rash. This one rinses clean. i have very hard water and this is the only detergent that effectively cleans my cloth diapers.